Peter introduced our host Gary, an assistant of the new owner of the Slanj Restaurant (formerly the Rustler’s Restaurant), Mr. Steven Muirhead, and thanked him for sharing the space. Held monthly Board of Director’s meetings on first Wednesday of each month. Encouraged all CMW committee chairs to review their activities and members. Worked with Preston and Mary Helen on Website fonts. Submitted CMW’s answers to the Scottish Clans in America survey. Completed this with Randy McFarland and Laurie Jackson. Continued liaison with Arrochar/Tarbet groups in Scotland. Facilitated CMW’s 2014 AMM to be in Slanj restaurant (old Ballyhennan Church) in Tarbet. Worked with board on updating/changing CMW Bylaws. Bringing proposed changes to June Annual Membership Meeting for approval. From June 2013 to June 2014 Clan MacFarlane Worldwide’s Heritage Committee continued throughout the past year with contributions from members: Peter McFarlin, Andrew MacFarlane, and Neal McFarland. Cheryl McFarlin Corey became a member in January of 2014. Much of the Committee’s work centered around projects and articles for the committee’s Heritage Corner column in the Loch Sloy! newsletter. In September, 2013, Peter and Karen McFarlin traveled to Arrochar, Scotland for seven days of participation in the Hidden Heritage community archaeologic investigations of Tarbet Isthmus. This is where the Lennox/MacFarlanes met (and fought?) the Vikings in 1263 as the Norsemen dragged their longboats over into Loch Lomond. They met and worked with various Arrochar/Tarbet folks. CMW continued rapport and goodwill with people and organizations of the community. 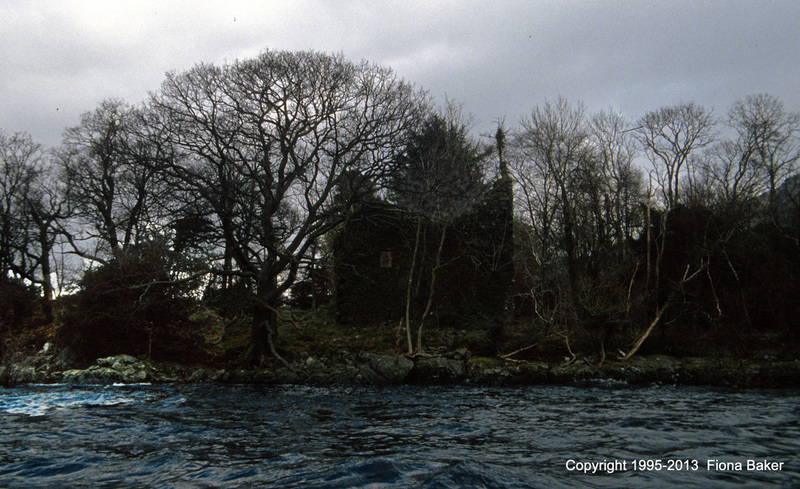 Then they traveled by boat and foot to the MacFarlane (once-occupied) promontory and Ardleish (Vanow). Fiscal Committee Report – Treasurer Chuck Poland presented the Fiscal Chairman James MacFarlane’s report. Our 2013 Financial Budget, attempting to create line item budgets, was an interesting exercise. We were over budget in nearly every category. Due to our increased participation in games, we spent $3,104 more than we projected. However, income exceeded expenditures and we ended the year $2,298.81 more then we spent, per the December 2013 budget report, and money in our savings account. That’s GOOD. Monthly budget report as of May showed balance of $5376.83. All reports appear in the quarterly Loch Sloy! We continue to grow and welcome new members from all over the world. We have members from all countries in the UK including Scotland, Northern Ireland, England, and Wales, from Ireland, from Canada, from Australia, and from New Zealand. We have representation in Japan, The Netherlands, France, Spain, Denmark, Slovakia, Germany, and South America. In the United States of America we have members in every state now except Montana and Vermont. Another year has come and gone celebrating the continuing success of CMW. Marie and I have been honored to bring you these successes through the newsletter. At times, it has led to some late minute scrambling to make our deadlines, but we were able to get the four newsletters published. We have been able to move our newsletters to our website, thanks to Preston McFarland and Devin Mack. We are testing software called “DreamHost,” in which we can transfer files to the web page in a PDF format, making it much easier for all voting members to access. In fact, Devin has moved all of the “Loch Sloy!” newsletters to the website. We have had a very active year with our Facebook members jumping from 327 members this past year to over 850 as of June 1st of 2014. Members are encouraged to participate in dialogue, send in pictures and stories related to their Scottish background, and enjoy the friendship of others. There’s been some great content added to the site. We receive contributions from many members and as a result we’ve had some great articles in 2013. I’d like to point out “Virginia Records for the Duncan McFarland Line” by Mary Helen Haines which has been very popular. All of these articles are well written and help to share the history and culture of Clan MacFarlane. We’ve also uploaded all past issues of the Loch Sloy! which can be found in the “Newsletter” section of the User Menu (login required). Traffic to the site is up by 36% with the biggest gains seen in fall of 2013. The average visitor is viewing 2.8 pages per visit and staying on the site 2 minutes and 45 seconds. The majority of our visitors are from the United States. Rounding out the top five, in order, are the United Kingdom, Canada, Australia, and New Zealand. The overwhelming majority (83%) of our visitors find us using Google. Another 7% find us using Bing. Most visitors find us while searching for terms like “clan macfarlane” or “macfarlane tartan”. Facilitated the monthly board meetings by producing agendas and minutes of each meeting. Helped coordinate the by-law change requests voted on by the board. Andrew continues to add our new member’s genealogies to his database at http://www.clanmacfarlanegenealogy.info and to resolve conflicts in information as it arises. We now have 410 members in the MacFarlane DNA project with FamilyTreeDNA, which is an increase of 94 participants since the last AMM report. There are 332 Y-DNA testers (for the male lineage), and of those, 101 have done the full 111 marker test. As this project grows we have more and more information and connection with our lineages. We also have 116 mtDNA testers (to follow the female lineage), and 135 members who have taken the Family Finder test which can help with both the female and male lines. Committee members are Neal McFarland, Michael A. McFarland and Keri Mack. A total of six members were nominated to run for election this year to serve on the Board of Directors for the 2015-2017 term. Of those, four nominees have declared their candidacy. They are: Barbara Duff, Melissa Knox, Annette MacFarlane and Preston McFarland. Ballots for voting will again be sent electronically to all eligible voting members through Survey Monkey to ensure 100% anonymity of ballots cast. Results will also be automatically tabulated by Survey Monkey. Melissa Knox is working on adding section to the web-site where you can order t-shirts, tartan ribbon, wrist bands, etc. For any purchase of any item from Amazon, if you go through our CMW page to get to Amazon link, CMW will benefit. Completed a Handbook for new tent delegates with “how-to” instructions, examples photos, etc. June 2014: 28 Delegates covering 19 states and New Zealand. We added Kentucky this year. We have added Terry and Lorraine Sandeen as delegates in Florida and Anne and Kenneth Fraley in Kentucky, who received help from William Hunt and Susan Pavlech. CMW hosted tents at 30 games from June 2013 to June 2014. Discussion about three possible locations: St. Louis, Missouri, Nova Scotia, and MacPherson games in Kansas. John McFarland spoke for St. Louis, saying it was held in Forest Park, the largest city park in the U.S. Mary Helen explained about the “Calling of the Clans” on Friday night. Barbara Duff mentioned the growth of our membership in Canada, and Douglas McGaw promoted MacPherson. Vote was held and the St. Louis site, which takes place in the last weekend of September, was the winner.